You’ve heard of Bitcoin, but what is it really and why is everyone talking about it? In reality, Bitcoin is just one type of a new form of digital-only currency, also known as cryptocurrencies. This new currency, as well as the technology behind it, are quickly becoming new business opportunities for Winnipeg. However, these are complicated topics – that’s why Economic Development Winnipeg (EDW) has prepared a high-level overview that will help you finally answer the question, ‘what exactly is Bitcoin’? 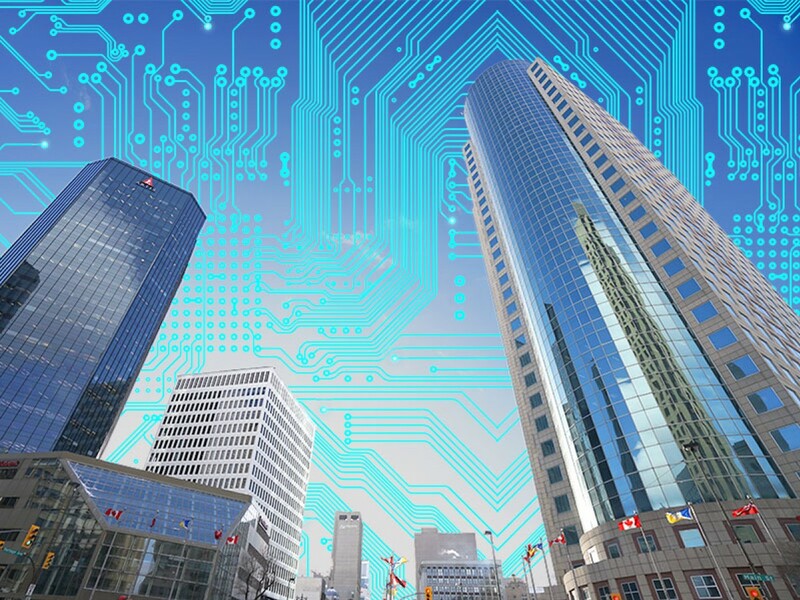 We’ll be answering the other crucial question on how Winnipeg has great potential to work with these new technologies in another blog post. Disclaimer: This post isn’t intended to be viewed as a technical guide, but rather as a high-level overview of a complex subject. EDW is not explaining these concepts in full technical detail, and this should be read only as an introduction. Cryptocurrency is a new form of digital-only currency that includes hundreds of different currencies including Bitcoin, Ethereum, and many more. The way to get a portion of these currencies, or ‘tokens’, is to ‘mine’ for them – setting up a computer to solve a computer-generated code faster than anyone else, which will reward the first person to crack that code with a token (or fraction of a token). Cryptocurrencies aren’t valued like the money in your bank account, which is set through a central bank (for example, the Bank of Canada). The benefit of a central banking authority setting monetary prices is that the value of the money is relatively stable, so the $20 in your pocket today should buy you roughly the same number of things next week. On the other hand, cryptocurrency prices are based on their perceived value – similar to the stock market, where supply and demand raises and lowers the value of shares. This price fluctuation can shift dramatically in a very short amount of time, which is why some people have become Bitcoin millionaires within days – while other investors have seen the value of their Bitcoin plummet. Given its volatility, why then do people see value in cryptocurrency at all? There are a few different answers, but one of the biggest reasons is that, globally, some people do not trust central banks. Individuals in certain developing countries (such as Venezuela, for example) have experienced central banks being unable to effectively manage their country’s currency, meaning in those cases few traditional investment options are available. There’s a reason that Bitcoin was founded in 2009 during the global financial bailout: people were looking for alternative investment options. With a worldwide demand for cryptocurrencies, the value of some tokens like Bitcoin have risen (and fallen, but we won’t get into that here). Economists haven’t reached a consensus on what the reason is for the rise in price for some cryptocurrencies over others, but supply and demand plays a significant role – over the past few years people have heard about Bitcoin and chosen to invest in it. As demand goes up, the value of Bitcoin has risen. Another reason for the price increase in Bitcoin is that it now costs much more to run the necessary mining hardware to collect tokens – where years ago people could mine from home, now a much more sophisticated infrastructure is required to mine successfully, and so it is more expensive to operate. Finally, it is now easier than ever to actually use Bitcoin to purchase items, which plays a part in its increased value and marketability as a real-world currency solution. This combination of more expensive and specialized equipment, as well as knowledge of cryptocurrencies becoming more commonplace and easier to use in the real-world marketplace, means that Bitcoin and other crytpocurrencies are more valuable to own, which raises their purchase price. Getting your hands on cryptocurrency is not the same as going to an ATM and withdrawing money. Aside from being completely virtual (meaning you will never find a physical Bitcoin to keep in a safety deposit box – or at least, not a legitimate one), cryptocurrencies use a different way of establishing currency ownership. Using a technique called cryptography, the list of who owns cryptocurrency tokens are turned into a highly secure code, which cannot be faked or hacked. This means that ownership of those tokens is extremely secure for their holder. This new security has pioneered a way to authenticate and validate transactions, using a process known as blockchain. Blockchain is a decentralized database with multiple authentication processes and no single control point, which creates a more secure network because no one person has full control over the security requirements. When cryptocurrency miners obtain a token, this creates a ‘block’ in the chain. Part of the mining process includes validating the ownership of that code on the blockchain. This level of security is why blockchain is so secure: to hack a blockchain, you would need to change every single block on the chain before a new block is created. Currently, a new block is created in the chain every ten minutes. With today’s computing power, making a change of this magnitude at the required processing speed is simply impossible. Imagine an office space with multiple computers. Each computer is independent of each other, although they are all connected to the same network. Everyone working at a computer is working on a single document. But, rather than everyone working on the same document connected through the network, everyone has their own document copy saved on their own computer. Anyone can bring their computers in and out of the office to be part of this project – it could be six computers, it could be six thousand. In this scenario, when one person makes a change to the document they let the rest of the group know, and everyone will make the same change on all their individual computers. This way, everyone has their own copy of the same document. If one computer crashes, or the network goes down, the document still exists in multiple locations – which also means it can be authenticated by comparing one version against all other existing ones. What does this mean for Winnipeg? The applications of cryptocurrency mining and blockchain technology are very exciting, and we describe some of those opportunities in our next blog post. Read on to learn more!